Folklore has been described as the unwritten literature of a culture: its songs, stories, sayings, games, rituals, beliefs, and ways of life. Encyclopedia of American Folklore helps readers explore topics, terms, themes, figures, and issues related to this popular subject. This comprehensive reference guide addresses the needs of multiple audiences, including high school, college, and public libraries, archive and museum collections, storytellers, and independent researchers. Its content and organization correspond to the ways educators integrate folklore within literacy and wider learning objectives for language arts and cultural studies at the secondary level. This well-rounded resource connects United States folk forms with their cultural origin, historical context, and social function. Appendixes include a bibliography, a category index, and a discussion of starting points for researching American folklore. References and bibliographic material throughout the text highlight recently published and commonly available materials for further study. Fables, fairy tales, and myths often featured in American folklore, including "Little Red Riding Hood" and "The Princess and the Pea"
"...an excellent resource for all age groups on American folklore." "The easy writing style and timeless approach makes this a resource accessible to multiple audiences and a worthwhile addition to high school, college, and public libraries...a masterful job..."
"Recommended for high-school, college, and public libraries." 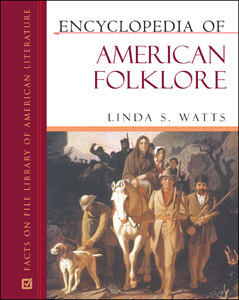 "...a welcoming introductory reference work to the world of American folklore...Recommended."